Out of the Shadows Artist Proof Giclee on Canvas by William Silvers offers a haunting image of an iconic moment from Return of the Jedi. This giclee on canvas comes rolled in a tube. If collectors are interested in AP #1, contact the gallery, as it can be purchased for an additional charge. The William Silvers Collection is officially released art from his own catalog. All is hand-signed, approved by the artist, and comes from his personal archives. William Silvers is one of the preeminent concept artists working in the film industry today. Starting his career in New York as an illustrator for ad agencies, William continued to perfect his style and technique. His love of film and his passion for art led him on a path to filmmaking. He has worked with nearly every major studio, and is known for his use of diverse styles and techniques. Passionate and easy-going, William Silvers infuses his love of film and artistic expression in every piece. 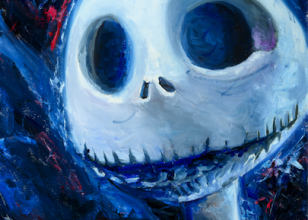 In 1995, his film career began at Walt Disney Feature Animation where he adapted his fine art painting skills to the world of filmmaking. He created unforgettable backgrounds for Disney classics such as Mulan, Tarzan, Lilo & Stitch, and Brother Bear. Eager for new experiences William enjoyed a stint as Associate Art Director for EA Sports-Tiburon. While there he contributed to the development of the award-winning game NCAA Football. William achieved a personal triumph when his long awaited book Painting Realistic Wildlife in Acrylic was published. The book was a compilation of his beloved Wildlife paintings and it included instructional techniques to teach and inspire young artists. His collaboration with Disney had bolstered a deep-seated desire to create meaningful work and that drive earned him a coveted stint at Industrial Light & Magic, a division of Lucasfilm Ltd. As a digital matte painter, William created some of the most stunning images for the feature films The Day after Tomorrow and Star Wars Episode III, The Revenge of the Sith. With his reputation in the Industry growing, William accepted a position at DreamWorks Animation Studios. His work can be seen in How To Train Your Dragon 2, Mr. Peabody & Sherman, The Croods, Rise of the Guardians, Puss In Boots, Kung Fu Panda 2, Kung Fu Panda Holiday Special and Shrek Forever After. The artist recently concluded his Sony Pictures Imageworks contract as a digital matte painter for the animated comedy adventure film Storks produced by Warner Animation Group. 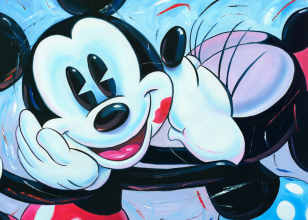 William also creates new and exciting fine art pieces for Disney Galleries and Lucasfilm Ltd. His art can be found throughout the Disney Theme Parks, and his long relationship with the Walt Disney Company continues to be a consistent theme in his career. Collectors from around the world have also embraced his personal art, which allows him to expand his artistic vocabulary and express the wide spectrum of styles that continue to bring him joy.